Metal Mold from protype Milling Machines. Milling machines let engineers and designers mill Metal Mold 3D prototypes quickly and inexpensively. They are also used for creating wax models for jewelry design. Often jewelers will use a milling machine for one purpose, to make waxes used in investment casting. These machines are as well able to mill in different materials, such as metal. The milled parts are used as prototypes or a models for lost wax casting/injection in the aerospace-, medical parts- business. 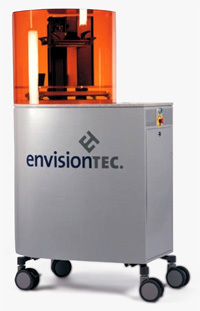 Our systems reduce cost and time-to-market by translating 3d Designs into hard copy 3D models. These models are so accurate that designers can go beyond concept modeling to produce tooling grade patterns ready for casting or mold-making. A milling machine is a machine tool used for the shaping of metal and other solid materials. Its basic form is that of a rotating cutter which rotates about the spindle axis (similar to a drill), and a table to which the work piece is affixed. In contrast to drilling, where the drill is moved exclusively along its axis, the milling operation involves movement of the rotating cutter sideways as well as 'in and out'. The cutter and work piece move relative to each other, generating a tool path along which material is removed. The movement is precisely controlled, usually with slides and lead screws or analogous technology. Often the movement is achieved by moving the table while the cutter rotates in one place, but regardless of how the parts of the machine slide, the result that matters is the relative motion between cutter and work piece. Milling machines may be manually operated, mechanically automated, or digitally automated via computer numerical control (CNC). Milling machines can perform a vast number of operations, some of them with quite complex tool paths, such as slot cutting, planing, drilling, die sinking, rebating, routing, etc. Cutting fluid is often pumped to the cutting site to cool and lubricate the cut, and to sluice away the resulting sward. With our fist-hand knowledge and experience throughout the jewelry manufacturing process from start to finish, we deliver quality metal molds.